Körber, Andreas; Meyer-Hamme, Johannes (10.4.2016): „Assessing Historical Thinking with the ‚HiTCH Test‘? Theoretical Approaches, Empirical Findings, and Future Challenges.“ Paper presented to the symposium „International Perspectives on the Assessment of Historical Thinking“ (Chairs: Breakstone, Joel: Meyer-Hamme, Johannes) auf dem Annual Meeting der American Association for Educational Research (AERA2016) in Washington D.C. (USA). Am 20. April 2016 habe ich zusammen mit Prof. Dr. Johannes Meyer-Hamme einen Vortrag „Assessing Historical Thinking with the ‘HiTCH Test’? 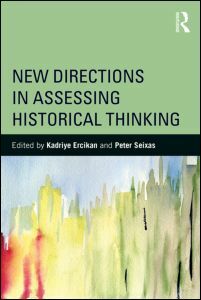 Theoretical Approaches, Empirical Findings, and Future Challenges“ im Symposium „International Perspectives on the Assessment of Historical Thinking“ gehalten, das von der Special Interest Group „History Teaching“ veranstaltet wurde. Körber, Andreas (1997): „Chronological Knowledge, Historical Associations and Historico-Political Concepts.“ In: Angvik, Magne; v. Borries, Bodo (1997; Eds. ): YOUTH and HISTORY. A Comparative European Survey on Historical Consciousness and Political Attitudes among Adolescents. Vol. A: Description. Hamburg: edition Körber-Stiftung; ISBN: 3896840053; pp. A 106-A 152.